Song For Marion is a film which causes an explosion of emotions. Paul Andrew Williams' latest film makes you feel as though you have been on an emotional rollercoaster, but not a jerky one that really knocks you about. A rather gentle one which makes you value life and laughter a little more. However if a movie is like an emotional rollercoaster, you cannot expect there to be no tears and there definitely are some of those in Song For Marion. Arthur (Terence Stamp) and Marion (Vanessa Redgrave) are an elderly married couple who seem like opposites with Arthur being rather grumpy and Marion being full of life. Despite Marion's love of life, she is gravely ill. 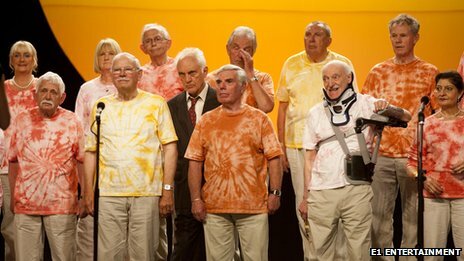 Besides Arthur, her great love in life is singing in a choir for pensioners, led by young Elizabeth (Gemma Arterton). When Arthur's beautiful wife leaves the world, he finds comfort in singing himself and it brings a change to himself and he realises what he has been missing out on. Song For Marion is a beautiful film, but also quite confronting as one of it's themes is mortality. It reminds us that we will all lose people in our lives that we love and that we ourselves will one day go and leave behind all the wonderful people we know and love. It really is a particularly morbid truth to be faced with when watching this film. The one big warning about this film is that if you have recently lost someone you love, this film may be a bit too painful for you to watch. Maybe not even recently, it is a very teary film for everyone from parents and children, grandparents and grandchildren and husbands and wives. However, there are also some very funny scenes throughout the film. The OAPZ are a beautiful bunch of people who embrace life and give their all in every song which is handed to them to sing. It is particularly funny watching these old men try to dance and their rendition of "Ace Of Spades" by Motorhead is absolutely hilarious. The flaw of this movie is that it is quite predictable and a little cliché. However, the cliché's are played out in a way that you don't really mind that they are present. The movie just seems to flow naturally and it doesn't try too hard to make you feel something. This all just comes naturally and even subtly with some amazing performances. 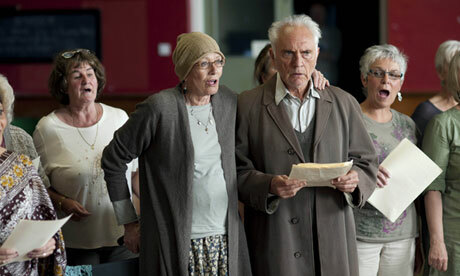 Terence Stamp and Vanessa Redgrave are absolute magic together. They have so much chemistry that you are completely convinced that you are watching a couple who are each other's world. Even though you see them at their toughest moments, you still see how happy their marriage has been. Stamp is completely heartbreaking in this role. Although he seems very much the grump, you can tell he is just battling with how to deal with the situation he is in and he always has the audience on his side. His final choir scene is so beautiful and powerful that there isn't a dry eye in the house. Vanessa Redgrave is also wonderful and plays her role with so much love and passion. Gemma Arterton is the perfect choice for the selfless leader of the choir and Christopher Eccleston does well as Arthur and Marion's son. Orla Hill, who plays the couples granddaughter is just beautiful in her role. She minds us that the love of the child is the most pure. You have to be prepared in Song For Marion have as many tears as you will laughs. It is heartbreaking, but also reminds you to treasure the beauty you have in your life. Is There A Superman Curse?